Remember that scene in Minority Report, where Tom Cruise is on the run from the law, but is unable to avoid detection because everywhere he goes there are constant retina scans feeding his location back to a central database? That’s tomorrow. 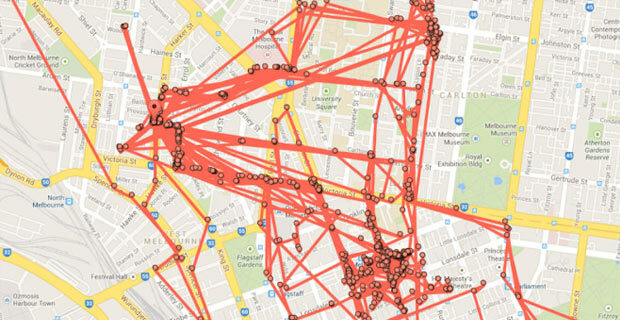 Today, Google is tracking wherever your smartphone goes, and putting a neat red dot on a map to mark the occasion. You can find that map here. All you need to do is log in with the same account you use on your phone, and the record of everywhere you’ve been for the last day to month will erupt across your screen like chicken pox. We all know that no matter what ‘privacy’ settings you may try and implement, our information is all being collected and stored somewhere. That knowledge sits in the back of our minds, and is easy to drown out by shoving in some headphones and watching Adventure Time on repeat until everything stops being 1984. But it’s a sharp jolt back to reality when you see a two dimensional image marking your daily commute with occasional detours to the cinema or a friend’s house. Looking at mine, I realised that a) I live my life in a very small radius, and b) there are places on my map that I don’t remember going. One of them I’ve apparently visited three times on different days. Once whilst “Biking” and twice while “Stationary”. All at times I wouldn’t usually be awake. I’m not sure what’s happening on Wood Street in North Melbourne, or why my phone apparently travels there without me, but I’m not going to rule out secret alien conspiracies. This never happened. UNLESS IT DID. Apparently this record only happens if you have ‘location services’ switched on in your phone; if you do and you’re finding you have no data, then it means that either you don’t exist or you’ve beaten the system. If it’s the latter, please teach me your ways; I know for a fact that I switched my phone’s location detection off, but apparently it somehow got switched back on. All Star Activist here… This is ONE of the solutions that Elizabeth was asking to be informed of. These pouches are known as “Faraday Cages” and block radio signals. You can even make them yourself although, it’s a lot of trouble. Just easier to buy one. I advocate their use heartily since I have had government agents follow me and commit crimes in the places I had been to in order to set me up for the blame. GET THIS TO PROTECT YOURSELF! Oh well. 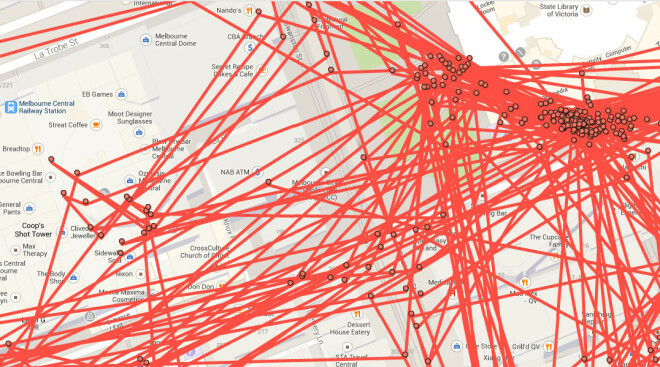 Perhaps this month I’ll take some inspiration from the runner who used Nike+ draw dicks – except this time when the dots are joined, they’ll just form a huge, unblinking eye. With occasional side trips to Wood Street. Elizabeth is the editor of Voiceworks, and has been published in Film Ink, Metro, The Punch, and Lip Magazine. She tweets terrible puns @ElizabethFlux. Cell phones can operate with as little as 1-millionth of a normal signal! A minimum of 80 dB attenuation (blocking) material is required to achieve blocking, as well as a complete (no leak) seal. The Block-it Pocket works by incorporating pure silver onto a high quality nylon ripstop fabric equaling 100+ dB attenuation. Which is then hand sewn into the inner pocket, extending beyond the cover to create a complete faraday enclosure. This is how the Block-it Pocket works! to maximize the protection each product is intended to provide. Extensive testing has proven that Block-it Pocket products work! Many people also do not know that virtually all new devices can be accessed remotely, even with the device powered off and the battery removed! It’s true! Just read this article we found recently to illustrate the remote, illegal accessing of wireless devices. A Simple But Effective Demonstration. Provides shielding from: Microwaves, RFs, EMFs, E-Fields and more. You will not receive calls, texts or email while storing in the pocket but all of your messages will be waiting for you when you need them. While we cannot guarantee 100% shielding/blocking 100% of the time due to potential damage or misuse, we have had 100% success in all controlled tests! The Block-it Pocket Works! Simply make sure the clasp is securely fastened for complete signal blocking. That’s it! Eliminates outside entities from tracking or hacking you! Avoid annoying phone calls or texts at just the wrong moment! No more damaging radiation while carrying your device! Protects RFID Passports, Credit Cards and Transponders! We are proud of the products we’ve developed and we know you will be satisfied too. If you are not completely satisfied with the quality and performance of any Block-it Pocket product, simply return it within 30 days for a full refund. We know how much information the NSA can grab in terms of cell phone usage — namely, calls made and received and length of conversations, along with phone and phone card metadata like IMSI and IMEI numbers. 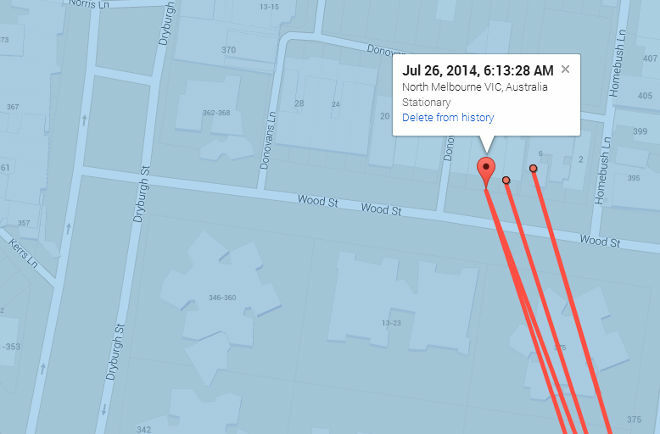 It can even grab location data, although for some reason, it claims it never does. (No matter, plenty of law enforcement agencies like gathering location data, so it’s not like that information is going to waste [bleak approximation of laughter]). According to Ryan Gallagher at Slate, the NSA, along with other agencies, are able to something most would feel to be improbable, if not impossible: track the location of cell phones even if they’re turned off. On Monday, the Washington Post published a story focusing on how massively the NSA has grown since the 9/11 attacks. Buried within it, there was a small but striking detail: By September 2004, the NSA had developed a technique that was dubbed “The Find” by special operations officers. The technique, the Post reports, was used in Iraq and “enabled the agency to find cellphones even when they were turned off.” This helped identify “thousands of new targets, including members of a burgeoning al-Qaeda-sponsored insurgency in Iraq,” according to members of the special operations unit interviewed by the Post. Normally, turning a cell phone off cuts the connection to towers, effectively taking it off the grid and making it only traceable to the last point it was connected. The Post article doesn’t explain exactly how the NSA accomplishes it, but other incidents over the past half-decade offer a few indications of how this might be done. In 2006, it was reported that the FBI had deployed spyware to infect suspects’ mobile phones and record data even when they were turned off… In 2009, thousands of BlackBerry users in the United Arab Emirates were targeted with spyware that was disguised as a legitimate update. The update drained users’ batteries and was eventually exposed by researchers, who identified that it had apparently been designed by U.S. firm SS8, which sells “lawful interception” tools to help governments conduct surveillance of communications. The FBI’s use, in which cell phones’ microphones were remotely activated to record conversations (even with the phones turned off), probably had some bearing on Snowden’s request that journalists power down their phones andplace them in the fridge. First, two telcos that provide service to millions of cell phone users are known to be overly cooperative with intelligence agencies. You may recall the fact that Verizon and AT&T notably did not sign the collective letter asking the government to allow affected companies to release information on government requests for data. Given this background, it’s not unimaginable that Verizon and AT&T would accommodate the NSA (and FBI) if it wished to use their update systems to push these trojans. Add to this the fact that Microsoft and others have allowed intelligence agencies early access to security flaws, allowing them to exploit these for a certain length of time before informing the public and patching the holes. Add these two together and you’ve got the means and the opportunity to serve snooping malware to millions of unsuspecting cell phone users. Sparing usage, properly targeted isn’t really an issue. But if updates containing spyware have been pushed to the thousands of non-targeted individuals just to ensure the targets are included, it becomes more problematic, and the track record of the two agencies who have used this technology is far from pristine.